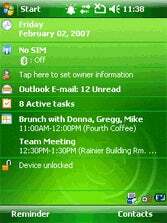 The update from Windows Mobile 5 to Windows Mobile 6 is similar to the update from Windows XP to Windows Vista, at least for most people. On the surface, the structure of the UI hasn't gotten a huge upgrade, but the new OSes feature a new skin and gussied up graphics. But if you look underneath, you can see the OS itself has some structural changes and new applications. CNET took WM6 for a trot and liked what it saw. Stuff like actually closing an app when you click the X button (instead of just hiding it), call history being sorted to the appropriate contact page, quick SMSing, updated Calendar, updated push email with Exchange Server 2007 support, HTML email (like the iPhone), and Windows Live integration made the whole experience more palatable for new users, which is a good thing. All in all it's not a revolutionary upgrade from WM5, but WM6 does offer you advancements you won't want to pass up.